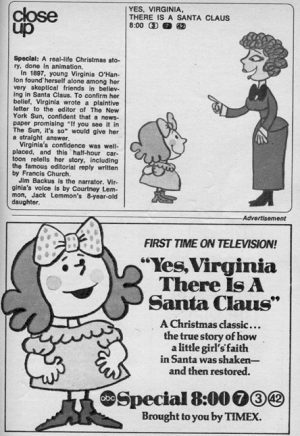 Partly based on a true story, a little girl writes to the editor of a newspaper concerning the existence of Santa Claus. Send. Me. The. 1974. Version. Of. Yes,virginia. There. Is. A. Santa. Claus. With. Narrator. Him. Backus. On. Dvd.